The map and many archive images on it. The service is actively developing, but already now it has a huge database of pictures from all over the world, which can be downloaded at maximum resolution, and read related information that is important for historical photos. The authors have done a titanic work and we can participate, and we, if we We still have old photos of our city or other locality. Service, which contains archival photos that you can watch directly in the panoramas on the map, superimposing them on modern ones. You can search for photos by request or by year. You can add your photos. Old photos of the whole world on a map from Google. Users from all over the world spread old photos, postcards, prints. The pictures show the place on the map. The user, therefore, sees what was in this place in the past. 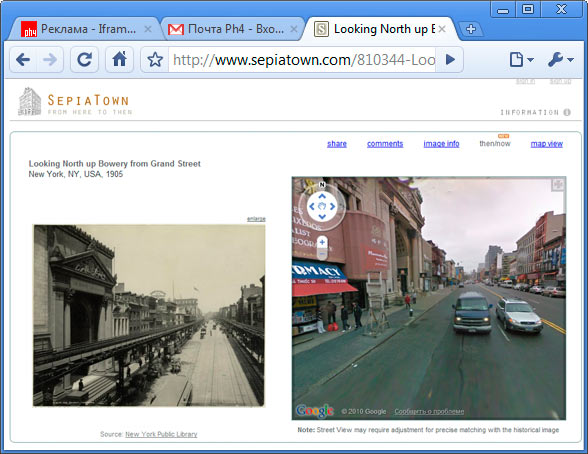 Click on the then/now link and see the location on the map then and now, as you see below. You can compare how it was and how it is. If you need to see the location of the location on the map, click on the map view link. The site is quite young and just started to fill. Here are represented New York, San Francisco, Los Angeles, London, Paris, Amsterdam, Moscow. So connect.